Algal feedstock is the foundation of the emerging algal biofuel industry. However, few algae found in nature have demonstrated the combination of high biomass accumulation rate, robust oil yield and tolerance to environmental stresses, all complex traits that a large-scale, economically competitive production scheme demands. Therefore, untangling the intricate sub-cellular networks underlying these complex traits, in one or a series of carefully selected algal research models, has become an urgent research mission, which can take advantage of the emerging model oleaginous microalgae that have already demonstrated small, simple and tackleable genomes and the potential for large-scale open-pond cultivation. 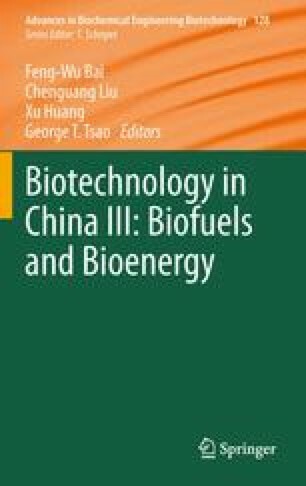 The revolutions in whole-genome-based technologies, coupled with systems biology, metabolic engineering and synthetic biology approaches, would enable the rational design and engineering of algal feedstock and help to fill the gaps between the technical and economical reality and the enormous potential of algal biofuels. In a “Consolidated Bio-processing of Solar Energy” (CBP-SE) scheme, a number of traditionally discrete processing steps, including photosynthesis, accumulation of energy storage compounds, and production of ethanol, biodiesel, advanced biofuel, high-value chemicals and food additives are consolidated into a single processing step, typically in a single cell or cellular system. Nannochloropsis spp. can serve as a research model and production strains for CBP-SE. Dongmei Wang and Yandu Lu have contributed equally to this work. We apologize to the many researchers whose past and ongoing works contributed to the development of microalgal energy in China but were not cited in this brief review.